For every force that thing A (as agent) exerts on thing B (as object) there is another force that thing B (as agent) exerts on thing A (as object). These forces are the same type of force, have the same magnitude, but point in opposite directions. How we find them has not changed. Create a sentence in the following form: "The (type) force on the (object) by the (agent)" Switch the objects of the prepositions -- change the names of the object and agent -- and you have found the Newton's Third Law pair. Newton's Third Law force pairs always act on different objects. They can never act on the same object nor be on the same free body diagram. Also, never forget, even though these forces may have the same magnitude, the effects of the forces may be very different because the objects have significantly different mass or made out of different materials. The video does the following example: A block \(m_A\) is sliding frictionlessly along the ground. A second block, \(m_B\) falls on it from above. Assume \(m_B\) doesn't bounce, but slides along \(m_A\) until it comes to rest on top of \(m_A\) -- it is moving the same speed as \(m_A\). The combined set of blocks is still moving though. What is that speed? 1. Two blocks with masses \(m_A\) and \(m_B\) are on an incline set at angle \(\theta\) from the horizontal and have coefficients of kinetic friction \(\mu_a\) and \(\mu_b\), where block \(a\) is in front and \(\mu_a > \mu_b\). When in contact, what is their acceleration down the incline? 1. A block is pulled along the ground by a horizontal force F. A rope is attached to the other side of the block, goes round a massless pulley attached to a wall, and attaches to another block on top of the first block. The coefficients of kinetic friction between the blocks is \(\mu_k\) and between the block and ground is \(\mu_g\). What is the acceleration of the block? 2. (Advanced) The sled slides frictionlessly along the ground. 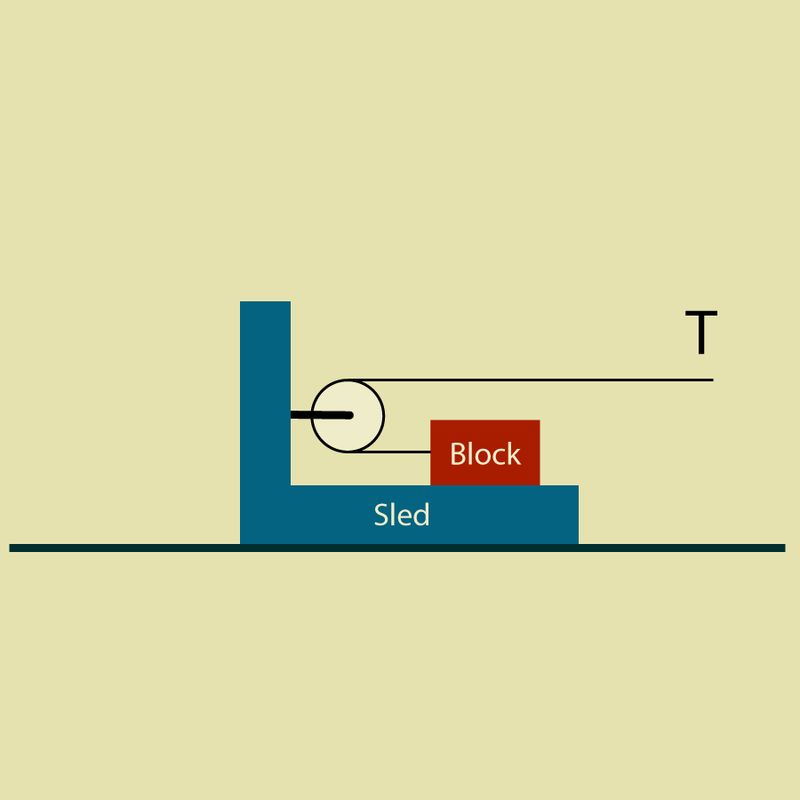 The coefficients of kinetic and static friction between the block and sled are \(\mu_k\) and \(\mu_s\). Assuming the system starts at rest, what is the maximum force you can pull on the (massless) rope such that the block will not slide with respect to the sled? What is the acceleration of the system? Again assuming the system starts at rest, what force will result in no acceleration for the block? 3. A car is pulling a trailer. The car exerts a pulling force on the trailer and the trailer exerts a pulling force on the car. Which force has greater magnitude? They are the same! That is a key result of N3. But, wait... If they pull on each other with the same magnitude, how does the car pull the trailer at all?